Every night Javier watches a game from the Copa America. It is always one of Chile's historical victories. He saves the videos on his computer and knows the exact timecode for every important moment in the game. Chapod has a soccer team and their own field. They almost never play Palin, a common Mapuche sport similar to field hockey. They play games every week against teams from other Mapuche and Chilean communities. Representatives from the government present funding for an indigenous music class for disabled children offered by a neighbor community. It is a difficult process to receive government funding but they do support projects in development and cultural preservation for specific Mapuche communities. The projects often help create opportunities for cultural tourism. A botanist from the city says that Chapod is lucky for having such a wide variety of plants. She struggles to identify them all because the women only know their names in Mapudungun. The botanist is in Chapod to teach the woman how to make herbal soaps from their gardens. They have classes to make soaps, textiles and other artisan products. The women love the classes because it allows them to prove that they still are able to learn new skills. 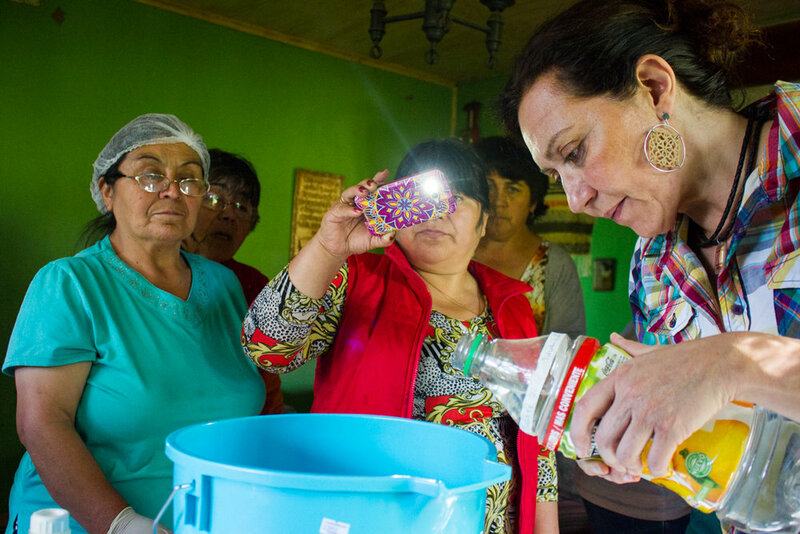 The women sell their soap to visitors to the community and in the markets of Temuco. During a soap making class, a teacher gave a presentation on gender equality. She spoke generally of women that feel trapped in violent households, sexual violence and the resources available to help them. The women could barely stop laughing talking about male gender stereotypes. After class they each took a pamphlet explaining how to make soap to prove they attended the soap making class if necessary. Some communities would be less welcoming to this classes theme than Chapod. — Poster in the women's soap making class. Chapod, Chile. A North American pastor and missionary, Mark Volstad, comes to talk with the people of Chapod. Felipe and Javier wait to eat during a power outage in their home in Chapod. Although the community has been rapidly developing; they have visitors from the city and more recourses than ever before, they still do not live like those in the city.